Well, I will tell you. My parents cut the regular-sized tennis ball, so there is a bit of dangly tennis flesh that hangs off it. I grab that piece and shake it and run around with it. When Mama throws the ball, I catch it. 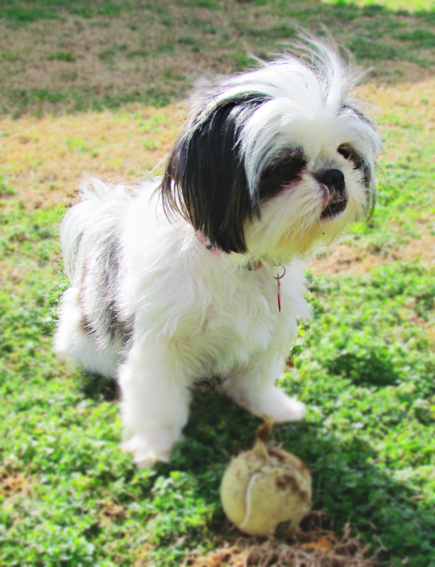 Here is me and my favorite Tennis Ball. I also have a tennis ball that is specially made for small dogs, like myself, but I don’t like to play it with too much. I am a big dog in a small dog’s body – why should I have to be content with a smaller tennis ball? Sheesh!